Architect and artist Li Han from Atelier 11 | China documents China’s rapid urbanization in intricate, elegant renderings, part architectural drawing, part anime still. 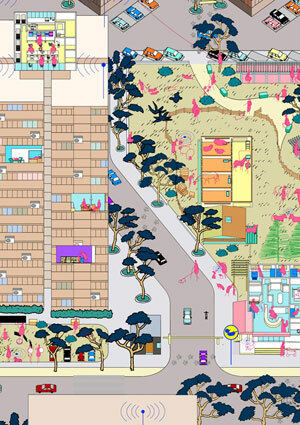 According to Alison Furuto at ArchDaily, Li presents the “spontaneous interaction between the urban environment and human activities.” The drawings not only document current conditions but also offer bold environmental visions for neighborhoods in China’s capital. Two of Beijing’s metro lines connect at Xi Zhi Men metro station (see image above). 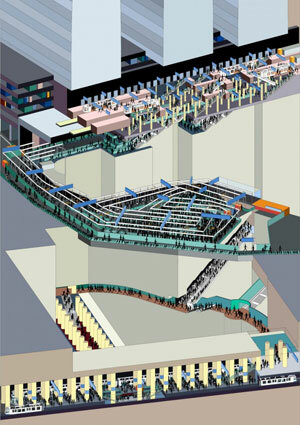 “The endlessness, crowdedness, and chaos shown in this one of the busiest spots in Beijing make the place a typical example of how people’s daily life and the urban space exert influence on each other.” Here, Li isolates the busy transfer route within the station, visualizing the complex path. 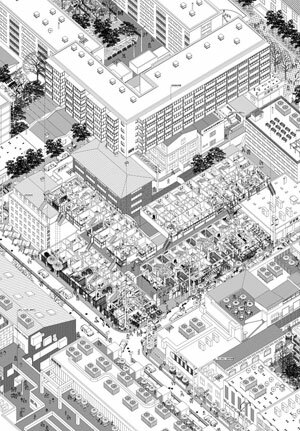 For 798, the art district in Beijing, Li and Atelier 11 created a drawing that shows not only the architecture but the roads, greenery, infrastructure, along with the “furniture, mechanical equipments, plantations, billboards, displays, and even tableware in the restaurants.” Li overwhelms with detail, but in doing so shows the “complexity and diversity” of the district, and perhaps all urban landscapes. Read the article and see more of Li’s drawings.